The 2016 GMC Canyon is back and better than ever! The 2015 model won award after award for its first year back on the lineup. Now, to further increase the options to consumers, General Motors is offering a diesel engine on both the GMC Canyon and Chevrolet Colorado. The new engine has received a “certificate of conformity” from the Environmental Protection Agency, certifying it for public sale. 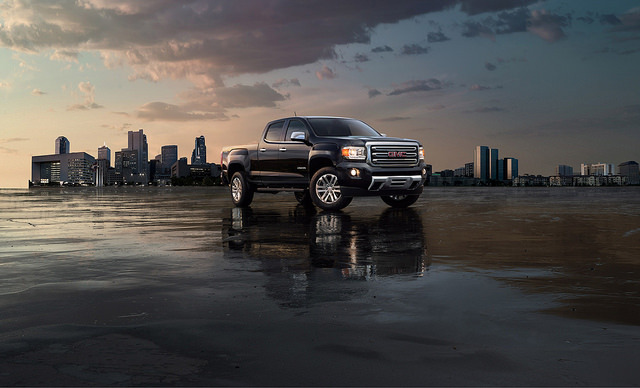 The 2016 GMC Canyon Diesel Engine offers up to 22 city/31 hwy mpg on two-wheel-drive models. That puts it at the top of any pickup truck, gasoline or diesel, for highway mileage. Four-wheel-drive versions are rated at slightly less, 20 city/29 hwy mpg. For comparison, the closest competitor is the 2016 Ram 1500’s 3.0-liter EcoDiesel V6 engine that reaches 29 hwy mpg. For a truck, the 2016 Canyon definitely gets great fuel efficiency. The new 2.8-liter turbo diesel engine is a powerhouse, offering up to 181 horsepower and 369 lb-ft of torque. Equipped with a 21 gallon tank, owners can expect around 650 miles on a tank of gas in two wheel drive models. The diesel engine is available on SLE and SLT crew cab models. The GMC Canyon is priced at just over $3,700 more than a comparable 3.6-liter V6 model. Check out the brand new 2016 GMC Canyon at Bradshaw Automotive today!